As a broadly effective, innovative, engaging, and replicable project, Johnson County Community College’s Student Sustainability Committee [the SSC, the Committee] is a compelling and powerful tool for developing student leadership skills and sustainability knowledge. The Committee, formed in 2011 as part of a student-led initiative for a dollar-per-credit hour fee to fund sustainable initiatives on campus, focuses on three broad categories: integrating sustainability into campus curriculum, events, and programming; improving daily operations with a focus on sustainable practices; and transforming the physical campus into a living, learning laboratory. The SSC expands sustainability conversations by funding standing projects and events, by supporting pilot projects both for operations and student engagement opportunities, and by offering our students the chance to work within and positively influence campus culture as leaders for more sustainable behaviors. In 2009, an Honors Forum class at Johnson County Community College tackled one problem: sustainability. Their campus of 19,000 credit students, covering 200+ acres, they determined, lacked the robust funding needed to be a leader in sustainable practices among higher education institutions. The recently-developed Center for Sustainability, an administrative body started the same year with federal funding and support from then-Senator Sam Brownback, had already secured administrative support for the ACUPCC and advised events and projects related to our campus’ culinary program. Honors students, though, sought a more structured and durable way to advance sustainable practices on campus. After completion of their coursework, which required a campus improvement proposal, students worked with administration to distribute a campus-wide petition in support of a dollar-per-credit-hour fee, which was presented to the Board of Trustees with support from nearly 2,000 students. Since its creation, the Student Sustainability Committee has played a role in every conceivable aspect of our campus culture, operations, and community. The Committee has supported saving the campus millions of dollars in avoided costs and demonstrated conclusively that attention to sustainable practices on a commuter campus is valuable financially and ethically while also enriching the lives of the students we serve. Johnson County Community College affords its students a unique leadership experience: they have the opportunity to support short-term events, to pilot innovative resource saving measures, and to shift campus culture both in the classroom and across the broader campus community. Johnson County Community College's Student Sustainability Committee allocates the Sustainability Initiatives Fund. The Fund supports three goals, which are both simple and broad. The SSC considers and votes on funding for proposals of new sustainability projects and initiatives on JCCC’s campus; proposes new sustainability projects and initiatives in its own right; and advocates in favor of sustainability topics on campus. As a group, the SSC is made up of 12 students appointed from five bodies (Honors, Student Environmental Alliance, Student Senate, Sustainable Agriculture, and Interior Design) and six at-large members. In addition to hearing proposals from other students, the Committee has had the opportunity to work with campus administration, faculty, staff, and members of the community to advance sustainability-related projects and conversations on campus. The Student Sustainability Committee solicits submissions from throughout the campus community. Proposals are evaluated and in some cases adjusted prior to review by the full committee; the SSC officers work closely with the Center for Sustainability to ensure that proposals meet their standards. Requestors then present formally to the Committee and take part in a question and answer period. Students do not vote immediately on the funding request, but are encouraged to reflect on and consider the presentation before voting at the next meeting, two weeks later. Faculty and staff from across the college participate in an advisory role. 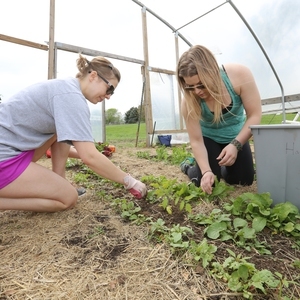 The Student Sustainability Committee is an ongoing project that continues to yield positive results for the campus and community at Johnson County Community College. Its list of completed projects is considerable and is [updated yearly] (http://www.jccc.edu/sustainability/get-involved/student-sustainability-committee.html). Among our most meaningful projects are those that have yielded the opportunity to see campus as a living laboratory and the enrichment of our students’ educations, both in and outside of the classroom. Three years before the Student Sustainability Committee began, in 2008, JCCC offered its first classes in Sustainable Agriculture. Via support from a USDA grant, the partnership with Kansas State University’s Extension Office began offering classes distributed across several campuses. When faculty support from KSU moved on in 2010, JCCC took over the program, where it continues with regular funding support from the Sustainable Initiatives Fund for equipment and internships. In 2011, JCCC began its work to support academic enrichment across the curriculum. Via its funding of Sunflower mini grants, which provide support for all faculty as they develop sustainability-related curriculum, the Student Sustainability Committee has reached over 29,000 students to date and supported nearly 100 faculty in 150 unique courses. Grant recipients have received funding support in every instructional unit of the college, from the humanities to STEM fields, contributing considerably to the normalization of sustainability-related conversations among our campus community. Though momentum built slowly at first, we now have new and established instructors alike coming to us for ways to enrich their courses with conversations about sustainable practices. Beginning in 2013, the SSC supported its first international education opportunity, The Las Pintas Solar Experience. The Committee offers partial funding for JCCC students to join an international service trip to Las Pintas, a suburb of Guadalajara, Mexico. 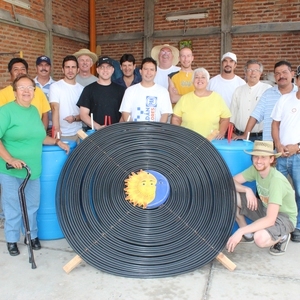 Following either course completion or faculty-directed educational workshops at home, students work alongside residents to install solar water heaters on homes in the Santa Rosa neighborhood of Las Pintas. Each recipient of a solar water system is then responsible for teaching five other families how to build their own systems, thus promoting the spread of skills and awareness for sustainability throughout the community. 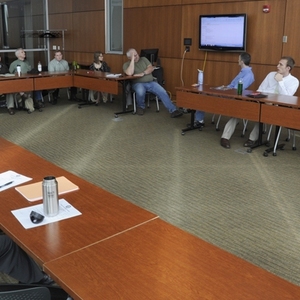 The Committee’s work continues to enrich the pedagogy of JCCC faculty and to support regional faculty development as well: thanks in part to support from the Committee, Johnson County Community College partnered in May 2017 with the University of Kansas to offer curriculum development webinars and a workshop for faculty from three states and five institutions, the first of its kind for both campuses. Also in 2011, the SSC began to debate the construction of its first capital project: a model state-of-the-art educational space built to the most exacting sustainable building standards. 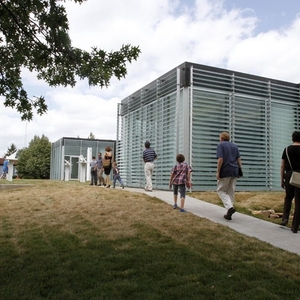 The resulting project, supported by the Committee, is Galileo’s Pavilion, is a 3,000-square foot, LEED Platinum certified building, the first on JCCC’s campus, and one of the first Platinum spaces in the state. 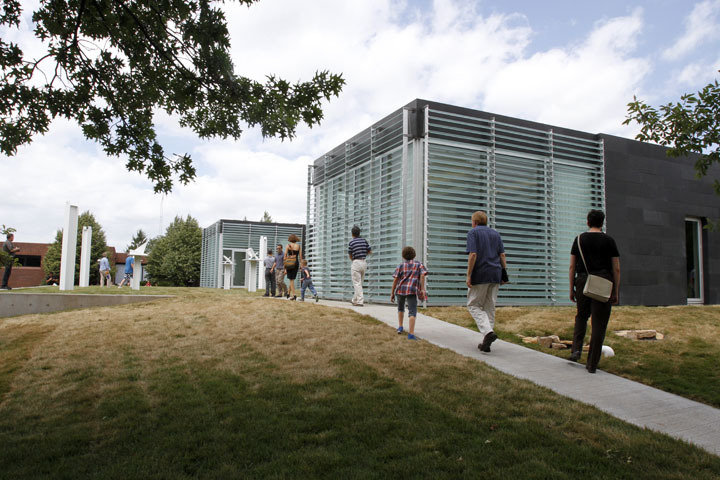 Galileo's Pavilion, which contains two classroom spaces and a student lounge, was conceived, designed, and built on JCCC's campus by the University of Kansas Master of Architecture Studio 804 program. The building, as all LEED certified spaces must, employs a wide variety of green building practices. JCCC students, though, have the opportunity to interact with the building's materials and technology in ways different from other spaces they use on campus. In Galileo's Pavilion, technical and General Education students access the space to change it, (by applying paint relevant to applied color theory to the walls in Interior Design courses) to understand its operations, (in HVAC, construction, and electrical courses) and as an object lesson for conversations about environmental ethics, biophilic responses, and the literature of climate change. The Committee, both as a source of funds for energy-related pilot projects and larger applications, has supported the Center for Sustainability’s aggressive energy efficiency work for years. Through their work, they have helped to reduce campus energy use by 25% (leading to nearly two million dollars in avoided costs) since 2008 and a 10% reduction in energy consumed from 2014-2016. The Committee’s LED pilot is one example of a project that started with students and was eventually adopted as a campus wide practice. Beginning in 2012, the SSC funded pilots of LED lighting options across campus. Eventually, with support from Center for Sustainability and campus facilities staff, the Committee tested LED applications in an impressive range of spaces: classrooms; faculty and staff offices; hallways; parking garages; and gallery and technical spaces used by Interior Design and studio arts students. Many of the options piloted worked well enough in practice to be adopted by campus facilities, and beginning in 2014, we underwent a yearlong conversion to LED lighting in our hallway, parking garage, and gallery areas. In a notable large-scale project, the installation of 80kW of solar on the Student Center, students chose to make a single, large allocation. The SSC’s decision in 2016 to make a vastly more significant contribution toward the campus’ largest single renewable energy installation will contribute to campus leaders considering renewable energy earlier in the planning process, and as a non-negotiable component of capital development. The Student Sustainability Committee is fully funded by a dollar-per-credit-hour fee as requested by students following a campus wide petition and formal request to the Board of Trustees. As an enrollment-based fund, resources fluctuate from year-to-year, but JCCC's credit enrollment has remained consistent enough since the Fund's creation to allow relative continuity in the degree and number of projects offered and flexibility for a wide range of student interests. One component of the SSC's work has no associated costs from its budget – advocacy. In its capacity as champions of campus sustainability, the Committee has formally supported new policies and procedures that positively affect campus culture. Through the Sustainable Initiatives Fund, JCCC students have the opportunity to learn about and support campus innovation in ways unique among community colleges nationally. While capital building projects are well outside the scope of initiatives the Committee could take on, students do take a particular interest in contributing to the planning process and ensuring their voices are heard in support of more sustainable building practices. Though the Student Sustainability Committee's work is ongoing, their work to date is impressive. Purely in terms of projects supported, the Committee has funded in whole or in part over 100 individual proposals since its inception, totaling nearly three million dollars. The committee’s rich work across traditional campus silos exhibits its commitment to incorporating sustainable practices everywhere it can make an opportunity to do so. In addition to the accomplishments cited above in curriculum and program development, our students’ ongoing and considerable support of co-curricular enrichment opportunities for their peers is worthy of note. Since 2012, the Center for Sustainability has hired over 30 interns, who have worked nearly 12,000 paid hours in hundreds of roles across campus. 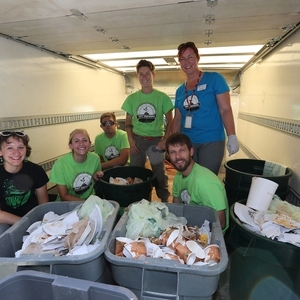 Student interns work to process specialty recycling, increase community understanding of recycling and composting procedures through special events, and support work across our community that has raising over $135,000 for student scholarships while increasing diversion from 14 to 51 percent since 2010. The SSC supports programs that allow JCCC to model excellence in sustainable practices for our campus, community, and state. 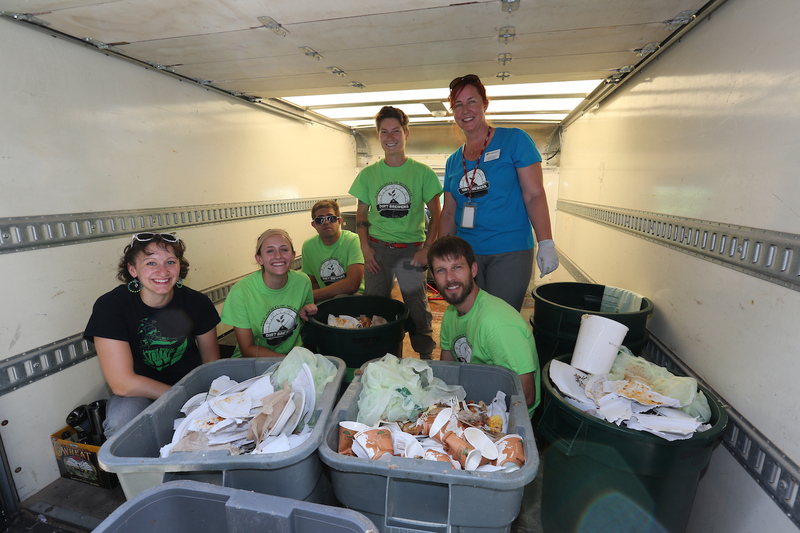 In the 2016 academic year, we have toured close to 200 people, including visitors from the EPA, local businesses and schools that are interested in food waste reduction strategies. Staff lead scores of tours of the campus as a whole and in part: compost operations, the farm, and LEED classroom spaces all draw area policymakers, educators, and students to campus in ways that allow us to both discuss and embody the value of a campus as a living laboratory. Individual projects among our many offer scores of opportunities for colleagues looking to begin or enrich their campus’ sustainability work. Student Sustainability Committee funded initiatives have become especially visible to the Kansas City area's arts community in several projects funded during the past three years. Following a pilot program and testing period, the Committee funded an LED lighting update for the campus' Nerman Museum of Contemporary Art. With its 11 galleries of internationally-recognized collections and over 100,000 visitors per year, modeling new lighting solutions for visitors and artists alike has improved the way we display artwork and reduced our total energy consumption for one of the most-utilized public spaces on campus. With adequate student support, any campus with a core group of engaged student leaders can offer hands-on leadership education for sustainability. Developing a committee to propose, review, and contribute to projects on campus provides agency to students who want to improve their communities. Students, faculty, staff, and community members undoubtedly enjoy seeing large capital projects such as solar installations and buildings, or educational events with speakers and presentations. On reflection, though, we have found that the most rewarding lessons learned from the development of a student committee and fund for sustainability remain undiscovered for some time. In the six years of projects reviewed by the Student Sustainability Committee, our largest allocation class has been toward student internships, and our single most effective ongoing project in terms of students reached is the Sunflower grant project for curricular enhancement. The lasting effects of those students’ curricular and co-curricular experiences in sustainability enrich their lives in ways that a single event may not. Through curricular and co-curricular experiences, and via support from the Student Sustainability Committee, our leaders on the Committee empower JCCC to serve as a successful model for the region and our Community College peers across the nation.